I ran yesterday morning in spring like conditions. It was 45 when I left the house and a warm 50 when I came back. I did an easy 6.5 miles. I was very glad I didn’t put my run off until the afternoon as our sunny sky with a slight breeze turned into high winds, hail, thunder, lightning and finally sideways snow. 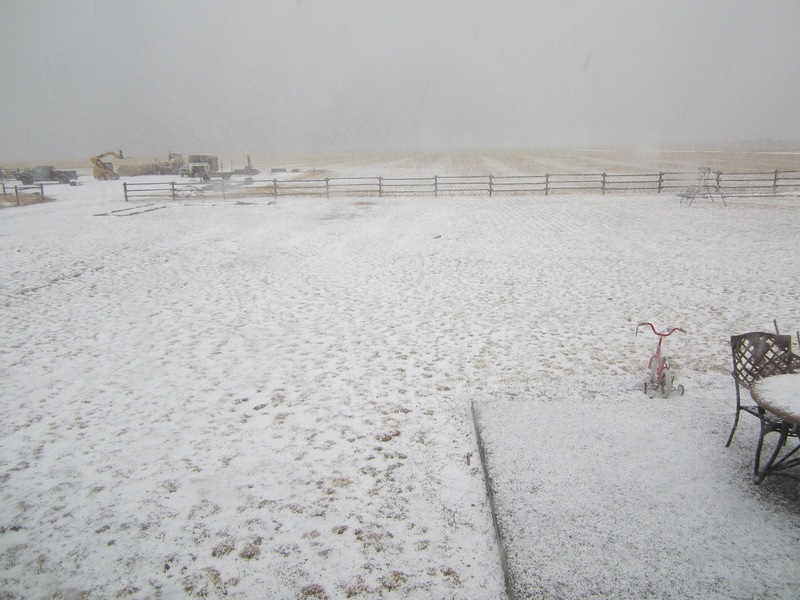 It was so funny to see the snow and hail coming down and have it be in the middle of a thunder storm! This was taken in the middle of the thunderstorm. I think it is the first time I have ever seen snow in a thunderstorm. and a little later as it just kept snowing and being crazy windy out. Practically the same view, but you can hardly see the fence or my husbands equipment in the back. Happily we only lost power for about 15 minutes. 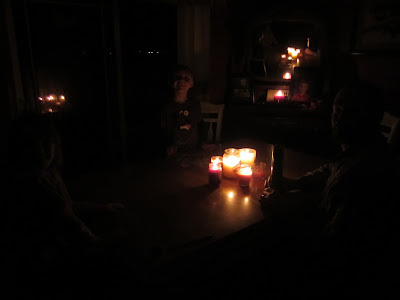 The kids however still wanted to play cards by candlelight after the power came on, so we did. Little cowboy kept proclaiming it the best night ever. 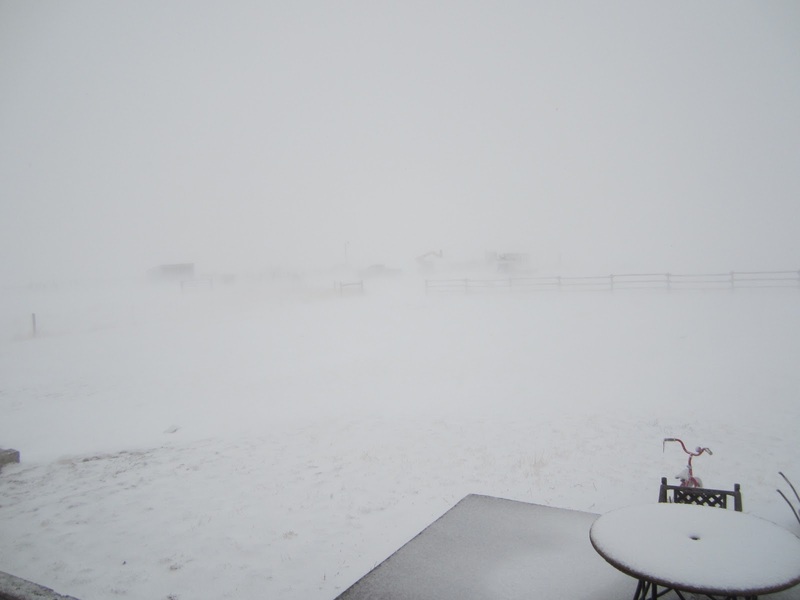 The snow continued to come sideways for several hours and this morning it is cold, super windy and not very hospitable out there. I may just keep my run inside today…just a hunch. I can handle cold and snow, but the nasty wind is not my friend. That and everything has a crazy layer of ice on it. I am so close to half marathon number 5...12 days..I don't want to risk a slip and fall on the ice injury. Have you ever seen a thunderstorm with snow? at what point do you wuss out on running outside? I love the candle light! Glad your power wasn't off long though. Thunder snow is fairly common her in the Chicago area. Bracing for another 10+" tonight. Joy. AH! You got THUNDERSNOW! We had a couple of storms like that last year, it really is crazy. 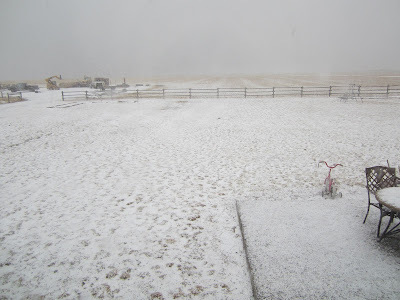 We got Thundersnow the other day too!!! Freaky isn't it!! Yikes, crazy weather. Never seen snow in a thunder storm before either. It really feels like spring in Spokane (knock on wood). It felt like spring in Seattle too. I didn't want to leave yesterday! That storm must've been awesome to watch! (from inside, of course) Love the caption under the candlelight pic, btw. lol. 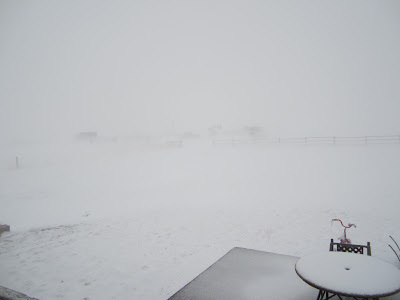 we had thundersnow a few weeks ago also and its pretty darn crazy isnt it! It happens here every once in a while and they have to remind people that you can shovel when its happening, so many dont seem to put the two together! Wow, good thing you got your run in early:) I am a big wuss when it comes to running outside:) I can run in the rain, but not if it's pouring. I don't run in the snow since it gets super slippery here in Seattle. Not good for the clumsy:0 Hope you have a great run indoors today! I've never actually heard thunder in a snow storm before but I've heard of it! I think that's what they had in Chicago the year before last. You're right to run inside, don't wanna risk getting sick or slipping and wrenching something. My friend Michael fell on ice on her run this morning. Wow, that seems pretty wild! The boyfriend is experiencing stuff like that in Minnesota all the time, but right now I'm in NC and have not been in anything like that. Wussing out of a run? When there is lightning. Definitely! That's quite the storm!!! We had a thunderstorm with snow a little bit ago too. It was so weird to hear thunder and see lightening as the snow was falling. I'm happy you didn't lose power long! That sounds wild! I love that your son wanted to keep the lights out for a bit longer than they were! I think it is really neat to enjoy the quiet side of life now & again! We're expecting a snowstorm here over the next 2 days and I hope I didn't blow a chance at good weather by resting today! That looks crazy! Never seen a thunderstorm like that! Since I have to run on the streets/sidewalks, I avoid conditions that cause dangerous situations for me AND the cars driving around me. Unplowed streets, ice, etc. I also have become scared of running alone in the dark. Glad you were able to get your run in before the storm hit! Crazy it went from high 40's to a crazy snow storm! I laughed at your "this is not a seance" picture! Glad they had fun playing cards in candlelight! I saw that when I was in IA. Thunder snow. Weird. Good thing you got your run in first! I don't mind running after its snowed or even when its lightly snowing but when the bits are pelting my face, I'm not happy. oh goodness, that's some weather!! It shouldn't be like this in March - I refuse to accept this lol! !